Based in Walsall, West Midlands the administration, fabricating and manufacturing facilities of Bricesco offer the customer the flexibility of complete UK manufacture / assembly to guaranteed UK quality and on time delivery, or the option of on site constructions. The bespoke steel fabricating facility is home to a team of specialist fully skilled and accredited / certified steel fabricating engineers. The workshops are equipped with shears, saws, bending and rolling machines, shot blasting and a paint spray booth. The skilled plater welders use ARC, MIG and TIG welding equipment to manufacture the products from a range of carbon and stainless steel. 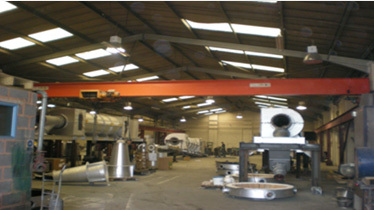 The factory also comprises the facility to carry out hydraulic, pneumatic and electrical projects. Skilled labour provides for the assembly and testing of machines and equipment manufactured prior to delivery. Bricesco manufacture a wide range of Bespoke Engineering Solutions for the construction industry including building columns, portal frames, fire escapes, ladders, mezzanine floors and hand rails, special architect designed trusses and towers to support water tanks. We can arrange for all steelwork to be shot blasted, painted or galvanised. The facility also houses the company’s specialist ceramic fibre module production unit. Specialist Fibre Engineers manufacture varying grades of high temperature fibre into ‘Quickfit’ modules which use a unique stainless fixing technique for installation. All of the ceramic fibre manufacturing activities conform to Health & Safety regulations to provide the customer with the very latest energy efficient insulation linings, expertly manufactured and installed to provide excellent and reliable service.